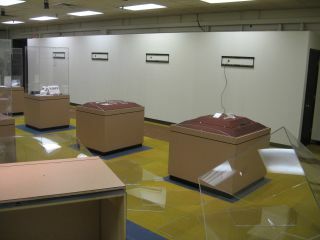 This photo from the Pisgah Astronomical Research Institute in North Carolina shows the scene after a Dec. 24, 2012, break-in in which theives stole a meteorite, televisions and other equipment. The items were later recovered and an arrest was made. Police have arrested a man accused of stealing 100 stolen meteorites taken from an astronomical research center in North Carolina, according to media reports. On Saturday (Dec. 29), Brian Thomas Koontz, 29, of Balsam Grove, N.C., was charged in relation to the theft of meteorites and electronics equipment from the Pisgah Astronomical Research Institute on Christmas Eve, the Asheville Citizen-Times reported. Based on surveillance footage, authorities believe another man, Robin Morris Baldwin Jr. of Hendersonville, N.C., was also involved in the theft. Most of the stolen goods, which include the meteorites, 10 large-screen television monitors, as well as Blu-Ray players, a microscope, and overhead video projectors, have been recovered from one of the houses of the two alleged crooks. The electronics equipment alone was worth more than $100,000, the Asheville Citizen-Times reported, and a value has not been set for the space rocks, which were on loan to the science center from three private collections. Meteorites can fetch high prices, especially rare types such as those that originated from the moon and Mars. For example, three seed-sized pieces of the moon that were brought back to Earth by a Russian robotic probe in 1970 were sold at auction 30 years later for $442,500. Meteorites are often sold by auction houses and even online at sites like eBay and Craigslist. Just last month, some stolen moon rocks originally collected by Apollo astronauts were finally returned to the possession of the state of Alaska, to which they were given after the first manned moon mission in 1969. The meteorites stolen from the North Carolina science center ranged in size from about the width of a quarter to one as large as a basketball, according to the Asheville Citizen-Times. "We're pleased that progress is being made," Pisgah Astronomical Research Institute vice president Dave Clavier said, according to the newspaper. "Any of them that we get back will be a great relief," he added. The crime occurred at about 3 a.m. on Dec. 24, and took about 45 minutes, police officials said. Koontz has been charged with felony breaking and entering, conspiring to breaking and entering, felony larceny, conspiring to commit larceny and misdemeanor injury to personal property. Baldwin is still at large.